Ginger Coconut Rice is a great alternative to plain white rice. It pairs very well with Caribbean Pineapple Chicken and Spicy Shrimp Stir-Fry. In a medium saucepan, heat oil over moderately high heat until hot, but not smoking. Sauté ginger for about 2 minutes, stirring frequently. Add rice and cook 2 minutes, stirring frequently. Add water, coconut milk, bay leaf, salt, Tabasco, and extract. Bring mixture to a boil. Reduce heat to low and cook covered, 20 minutes, or until rice is tender and liquid is absorbed. 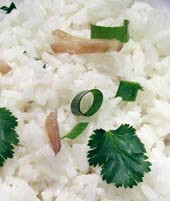 Remove pan from heat and sprinkle rice with scallions and cilantro. Let rice stand 5 minutes and fluff with a fork. Discard bay leaf and serve. This entry was posted on Thursday, September 6th, 2007 at 1:04 pm	and is filed under Master Recipe Index, Side Dishes, Speed Queen (30 min/less), Vegan or Vegan-able, Vegetarian. You can follow any responses to this entry through the RSS 2.0 feed. You can leave a response, or trackback from your own site.